Lift the 4-headed dragon by the handle to increase its wingspan and fly! 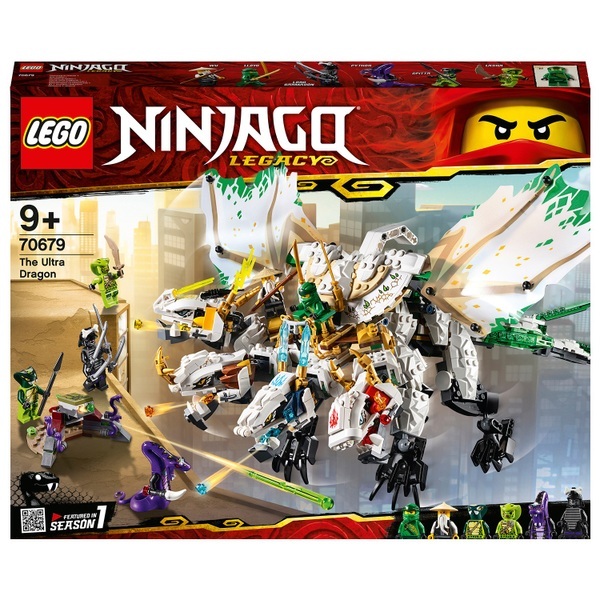 Swoosh into battle with ninja warriors Lloyd and Wu on The Ultra Dragon with this LEGO 70679 Ninjago Legacy The Ultra Dragon! Track down evil Lord Garmadon, Pythor and the Serpentine snakes with the LEGO Ninjago Legacy 70679 The Ultra Dragon! This awesome NINJAGO dragon has a dual minifigure cockpit, 4 dragon heads with stud shooters and snapping jaws, unfolding wings, whipping tail and a handle for easy flying and swooshability. This action-packed dragon battle toy comes with 6 minifigures with weapons to role-play and reimagine classic action from the Ninjago Masters of Spinjitzu TV show.